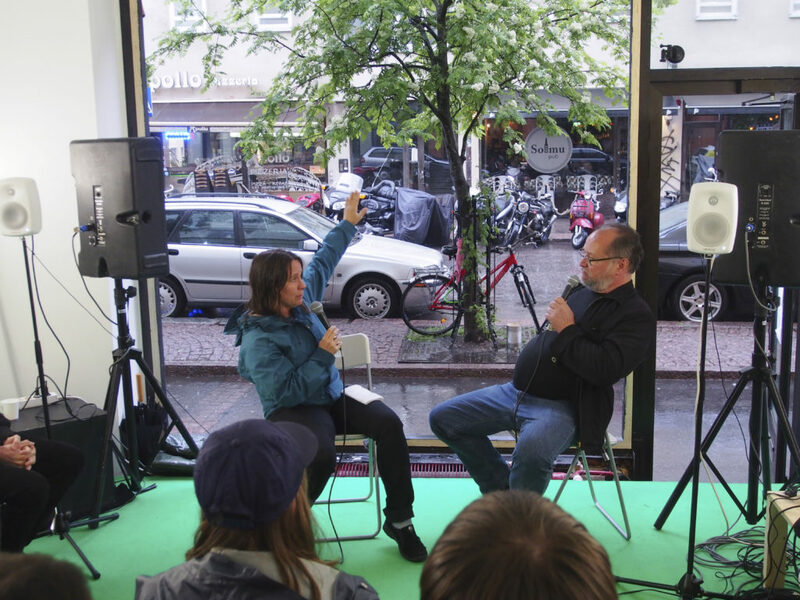 According the people who run it, Helsinki’s Sorbus gallery formed by accident. 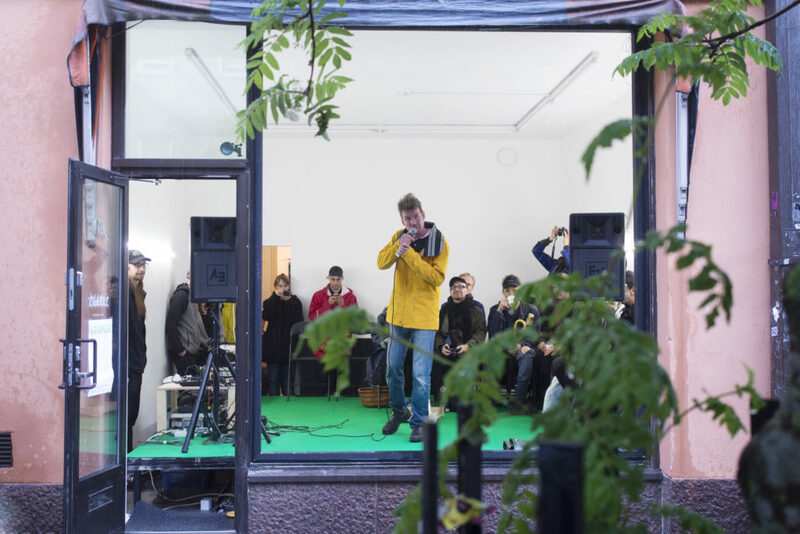 Beginning with one month’s notice when a co-operative that was renting the building on Vaasankatu Street called out for an art occupation, a team of volunteers produced an event in 2013. 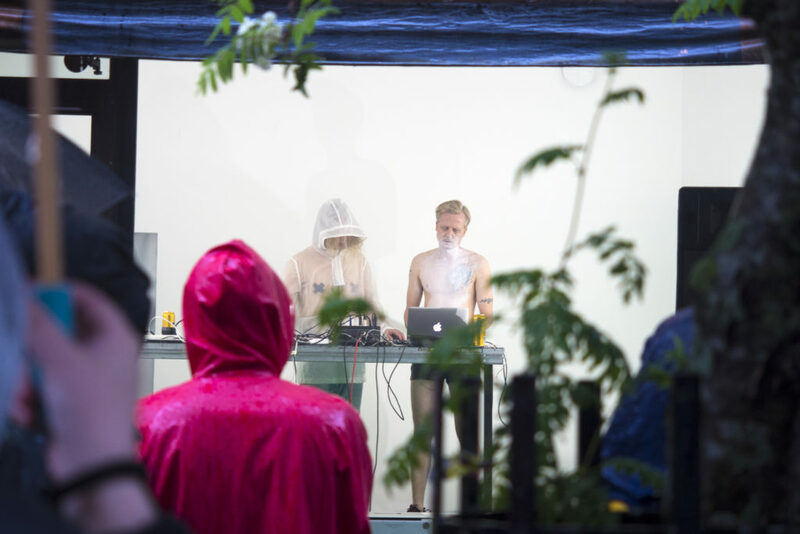 Called simply ‘Opening Festival,’ that programme would define the start of Sorbus and its mission as an interdisciplinary art space from then on. 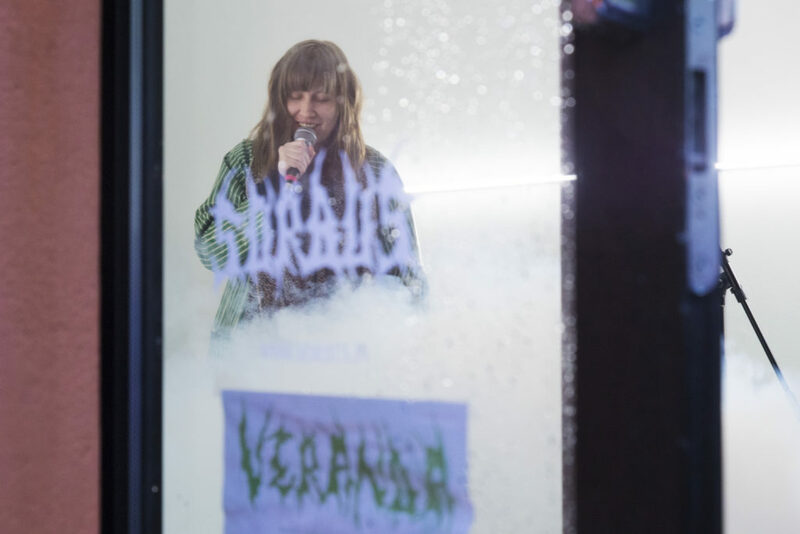 It featured music, performance, poetry, ‘live cinema’ and vinyl record cutting, kickstarting their all-in approach to an art programme that has since put on countless events and exhibitions, even expanding into becoming an art collective in its own right. Kallio Manninen @ Veranda. Performance view. Photo by Valo Vairio. Courtesy Sorbus, Helsinki. It’s nearly five years on and Sorbus is at an important juncture. Boasting an already impressive resume of shows — which includes their Fucked Up in a Bad Way series that surfaced at SIC Gallery, KASKL and Jupiter Woods — the artist-run space launches the Veranda open-air festival, running June 8 to June 18, with a self-proclaimed “metaphor for calming down.” Its members, Otto Byström, Henna Hyvärinen, Jonna Karanka, Sakari Tervo, and Tuomo Tuovinen, have removed rather than smashed through the window of their Helsinki storefront, turning the gallery into a stage and extending their art and music invitation to the general public. The event will run Thursday to Sunday for two weeks, with no entrance fee or age limits. It will feature all manner of artist, musician, writer, doom metal band, open to everyone and anyone within earshot. Sorbus, Fucked Up in a Bad Way (2016). Presentation view. Courtesy Original&theCopy. 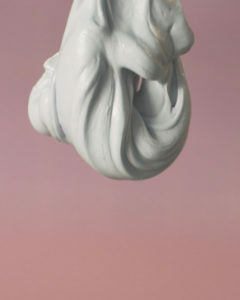 Courtesy Sorbus, Helsinki, + Jupiter Woods, London. ** Regarding the ‘removal of the big glass window that separates the gallery from the street’ from the Veranda press release, it feels metaphorical in a way, whats the intention of the project? Sorbus: From the beginning, there has been an idea of trying to make fine arts more accessible to everyone. Also, with Veranda there’s the idea of trying to get more in touch with the local community, and to see how it works out. Yesterday we went around Vaasankatu Street and taped notes on all of the doors apologizing for the possible disturbance. 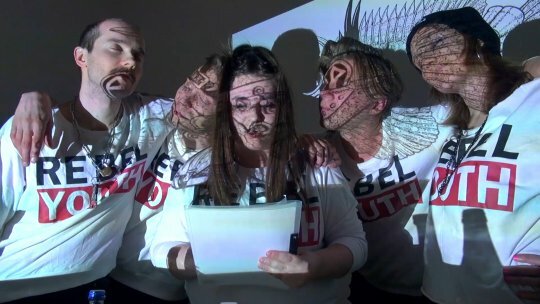 So getting more in touch with people who wouldn’t necessarily involve with an art space otherwise is one of the ideas, and mixing different audiences by programming such different acts for each day. 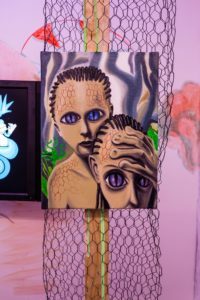 Of course, one could ask if we are kind of forcefully exposing people to art that they wouldn’t otherwise involve with. Maybe people want there to be glass between them and the art, or at least the kind of art they think they are not into? The original idea was to break the window from inside but now we ended up having a company removing it. This feels like a metaphor for us calming down. Draama-Helmi @ Veranda. Performance view. Photo by Valo Vairio. Courtesy Sorbus, Helsinki. **Does this project mark a shift in your curatorial aims, will you be hosting events that move away from strictly art-based projects and audiences? S: The aim of reaching and trying to engage with people from outside the art world has been there from the very beginning of Sorbus. Starting from the times of our opening festival in 2013, arranging concerts has been one way to do this – music attracts different audiences. Many of us have also been involved in different music scenes before and during our practice in fine arts. In fact, we are hosting way fewer concerts than a couple of years ago. We are now on our last year of a three-year funding from Kone Foundation, so we should start discussing what we actually want to do next year. It might be something different than what we’ve now been doing. It really felt that this is the last chance to do this kind of summer festival event. 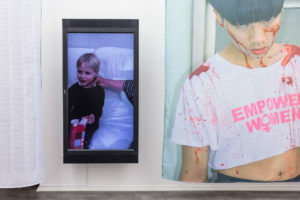 What comes to the curatorial aims, instead of just providing exhibition-after-exhibition we might just spend some time figuring out the as yet unknown possibilities of an artist-run space and the new ways of collectivising as we proceed. @ Veranda. Performance view. Courtesy Sorbus, Helsinki. **Why are interdisciplinary events so important right now, does it come from a place of dissatisfaction with how things are currently run? S: As said before, for Sorbus, a sort of interdisciplinary approach has always been there. Maybe, it’s also partly due to our strong background (in music). We have not seen any reason to exclude that side from our program, and vice versa. It’s good for arts to be in touch with things outside the art sphere. **What are some of the events over the coming at Veranda to look out for? We are excited because Veranda will also function as a premiere for new writing. Writer-dramaturg Minn reads her monologue about gorillas, aliens and motherhood. It’s a text that she has wanted to write for long time, but haven’t had the time or place for it before. Juha Valkeapää @ Veranda. Performance view. Photo by Valo Vairio. Courtesy Sorbus, Helsinki. Anna Torkkel and Masi Tiitta are dance artists with a strong ties between contemporary dance and art scenes. In their collaborative piece, an everyday act — standing up — is being stretched into a temporal performance. In this way, the minimalistic performance problematizes the seemingly simple nature of everyday functions. The Veranda open-air event is on at Helsinki’s Sorbus gallery, running June 18 to June 18, 2017.